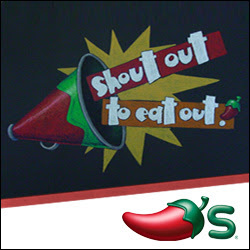 Do you have Chili's fans in your family as well? As well as entering to win a gift certificate below, you can also enter their great "Shout Out to Eat Out Triple Dipper" sweepstakes! To enter, visit the Shout Out to Eat Out website and create your own terrific trio by uploading a photo of your face into one of the provided images. You can also check out all of the other great blogs hosting $20 Chili's GC giveaways and enter to win as many as you want just by clicking here! Click this URL http://bit.ly/lmlDxZ then enter ACTING BALANCED as the name of blog hosting this giveaway. Leave me a comment telling me you've done this! 1 Bonus Entry if you tell me your three favorite foods (any foods!) that you would like to have all on one plate. 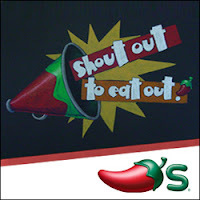 1 Bonus Entry (per method) if you follow ShoutOutToEatOut on Twitter, follow Chilis on Twitter, Like them on Facebook, and/or opt in to Chili's email club (you'll get a free appetizer coupon for registering). 1 Bonus Entry if you create your terrific trio on ShoutOutToEatOut and leave me the URL to it. 1 Bonus Entry (1 total) if you send this tweet and leave me the link: At @Chilis Good Things Come In 3's! Check out @2Wired2Tired http://bit.ly/linkyrave for 200 chances to win in the #tripledipper linky rave! 1 Bonus Entry (max 3 per day at least 2 hrs apart) if you follow me on Twitter and tweet about this giveaway by copying and pasting the tweet below and leaving me the link. Disclaimer: I received a $20 Chili's GC for completing this post. All opinions are my own.